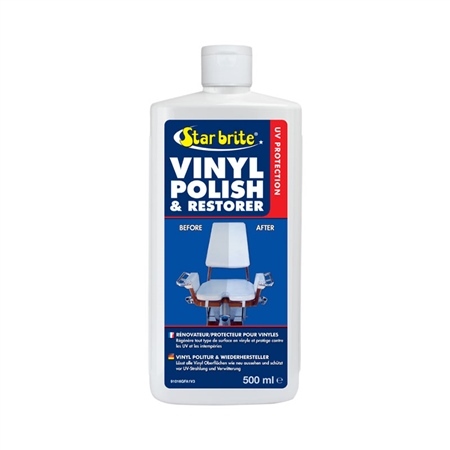 This revolutionary new formula cleans and restores all vinyl surfaces while leaving a polymer coating which provides UV protection and a long-lasting shine. Makes old, dull vinyl look like new. Removes stains and yellowing. Keeps vinyl soft and supple, while it also helps prevents vinyl surfaces from drying out and cracking. Works like a rubbing compound for vinyl, restoring the orginal color; it then preserves the finish like a fine wax. Does what it says on the "tin" BUT what it doesnt say is do not use in a sunny and hot conditions, it leaves a white deposit that is a s##d to remove if you do,otherwise excellent results !